Christmas In July Bring a Buddy! Extra MOTIVATION For You By Having a Friend Join YOU! Earn a Prize for every friend you bring. Get You In Shape's "Christmas In July"
It's that time of year again...Time for Christmas In July! For those of you who have joined within the last 12 months, this is our once a year Bring a Buddy Giveaway for you to invite anyone and everyone to come out and see "What Get You In Shape is ALL About!" I am always amazed when I go through how most of our clients come to us. It's through word of mouth and referrals. "Christmas in July" is just another time to give you an incentive to Give The Gift of Health to someone. We are THANKFUL that you enjoy the benefits that our program brings to YOU. We hope you notice the value and the benefits you receive from our program enough to INVITE your friends to come check us out. Well, now you get to share your love of Get You In Shape and our special community with others and invite them to come out and workout with you for TWO WEEKS FREE. It's pretty simple. We are GIVING prizes (including a FREE MONTH of GYIS) for just inviting a friend or friends to join you in the workouts. It's just our way to saying THANKS to you. Simple enough idea, right? And simple is good. Especially when it's such a winner all the way around. - A Chance to win prizes including a Free Month of GYIS! - Unlimited Additional Cardio Club Sessions For You. (If you are not already a member, you just need to bring your friend(s) with you to get your own free workouts in). What's In it for Your Friend(s)? - Two Weeks of FREE (no "strings attached") Workouts For Your Friends. This includes 8 GYIS fitness sessions and 4 Cardio Club sessions (12 total in two weeks) during the two weeks July 18th-July 31st. Our PASSION is to help and serve people like YOU! So this is an awesome way for us to attract the type of clients that we want, folks like YOU 🙂 As you know, though, we are also a business. With word of mouth and friends being where most of our new clients come from, it's a great way for us to bring new clients to our program. How to BRING A Buddy? So that we can make sure your friend or friends get the BEST possible experience from Get You In Shape, we ask that you share the three ways we are asking your friends to come, so we can help give YOUR FRIEND(S) all the details needed like what the days/times are, where we meet, fitness levels and what to bring. 3) Show up with you. If you just bring a friend, we ask that you help prepare them with what to expect and bring. Getting their information allows us to send them an email with the session times and options, what they will need to bring and some free stuff from us that will only be available to them as part of this Christmas in July promotion. This ALL ACCESS GYIS PASS Includes 8 Fitness Sessions PLUS 4 Cardio Club (Tu + Th) Sessions. 12 Total Sessions for FREE with NO Obligation. We encourage you to attend the same sessions as your friend since it is "bring a friend" promotion. If both of your schedules don't work, though, they can still come and participate in the two weeks. They can come to one session or all 12 sessions during July 18th - July 31st. All clients who bring a friend during our “Christmas in July” promotion will receive a special prize. Your friend(s) does need to be someone new to Get You In Shape. Every client who has a friend join one of our program options will be eligible to win prizes and a GRAND PRIZE of ONE FREE MONTH! Here are some options to help promote Christmas In July and Bring YOUR Friend(s)! 1. Make a personal phone call to invite folks you have in mind to let them know about the "GIVE THE GIFT OF HEALTH" Christmas In July. Let them know you only can bring a friend for TWO WEEKS. Direct them to sign up at www.FitCoppell.com or call us at 214-603-8287. You can also just let them know you will email them the details so they can sign up. You can also text them but they are more likely to respond with a personal phone call. 2. Invite on Facebook - You can just copy the picture at the top of the page ( http://getyouinshape.com/wp-content/uploads/2015/06/christmas-july-2015.jpg ) and post inviting people to join you. You will just need to have them go to http://FitCoppell.com to sign up. Here is an Email you can send to the person(s) you want to GIVE 2 FREE WEEKS! Hope things are going great for you. 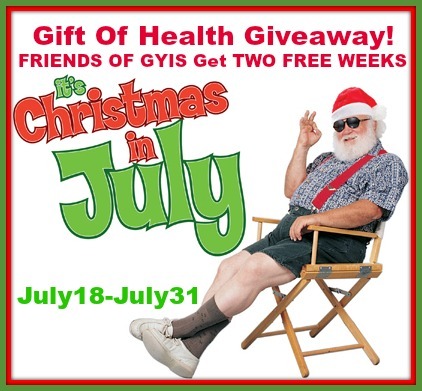 I’ve recently been attending Get You In Shape and the owner is having a Christmas In July giveaway. They are letting me Bring a Friend for Two Free Weeks to join me. It's from July 18th - July 31st and includes 8 Fitness camp sessions and 4 Cardio Club sessions. That’s why I’m emailing you. I would like to give you 2 Free Weeks for you to use. I’ve always wanted a fitness program to motivate me to stay on track and push me to reach my goals and Get You In Shape has done that for me. In fact I’ve already lost ______ pounds since I joined, feel better than I have in a long time and think you would enjoy it too. If you would like to take advantage of this gift, I’d love to give it to you as I’d really enjoy having you in the fitness sessions with me and I’m sure you’d love it! Just email me back or give me a call and let me know if you would like to take advantage of this great (and FREE) gift. If you don’t have time or are already part of a program you like, no problem. Just let me know so I let someone else use it. Again, I hope things are going well for you. Hope to see you soon.